Argentina vs. Brazil is the age old battle in South America. They compete in regards to almost everything: who has the better barbecue, which football team is stronger, who has the most beautiful people, etc. etc. And of, course, they compete over which side of Iguazu Falls is better. 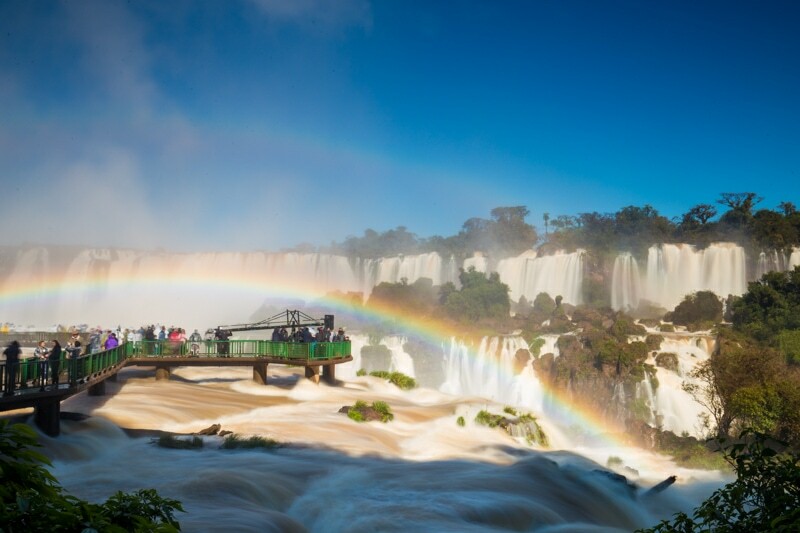 However, the two are strangely amicable in regards to Iguazu Falls. 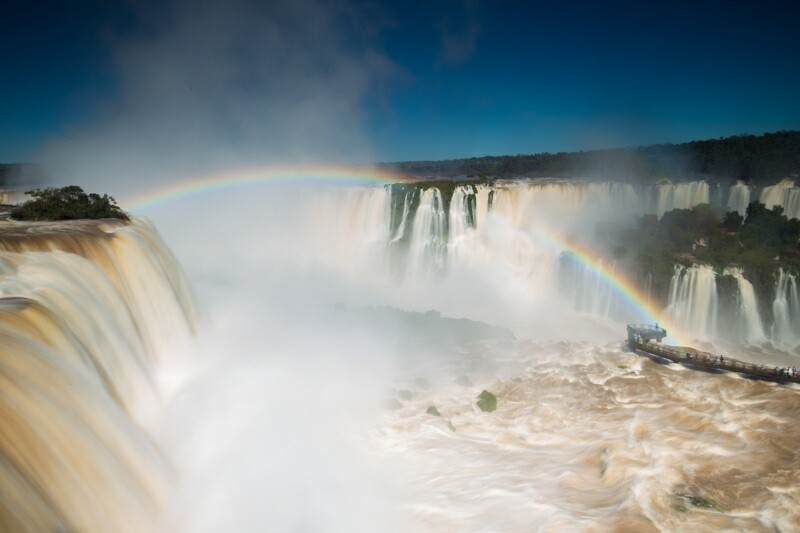 In fact, most Argentineans and Brazilians I talked to agree that you should visit both sides of Iguazu Falls. However, as an impartial visitor to Iguazu Falls, the first time I visited I had a favourite side. This time, however, I think my opinion changed. Or was at least less set in stone. 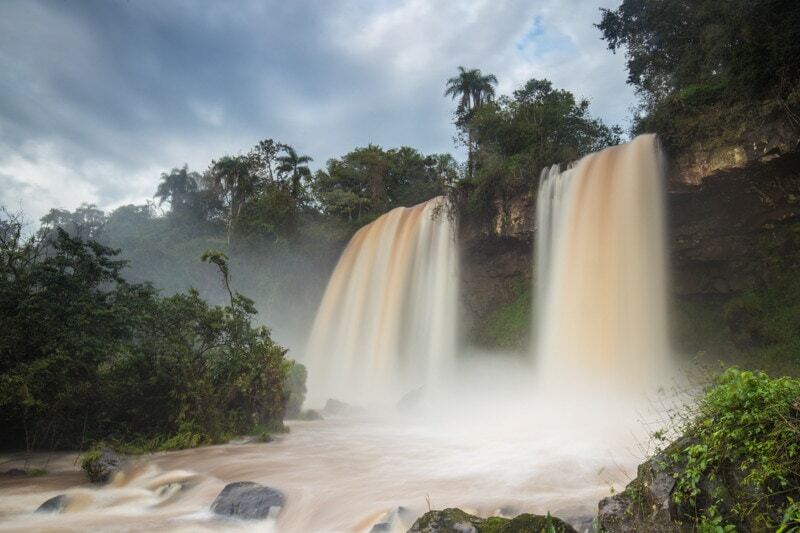 This is my discussion on which side of Iguazu Falls is better. The Argentinean side of Iguazu Falls is an absolute wonder. It really is. I’d be willing to bet that if you asked 100 people who visited both sides of the falls, 80 would say they preferred the Argentinean side. But why? These are some of the benefits. Variety: The true beauty of the Argentinean side is the variety of views on this side. 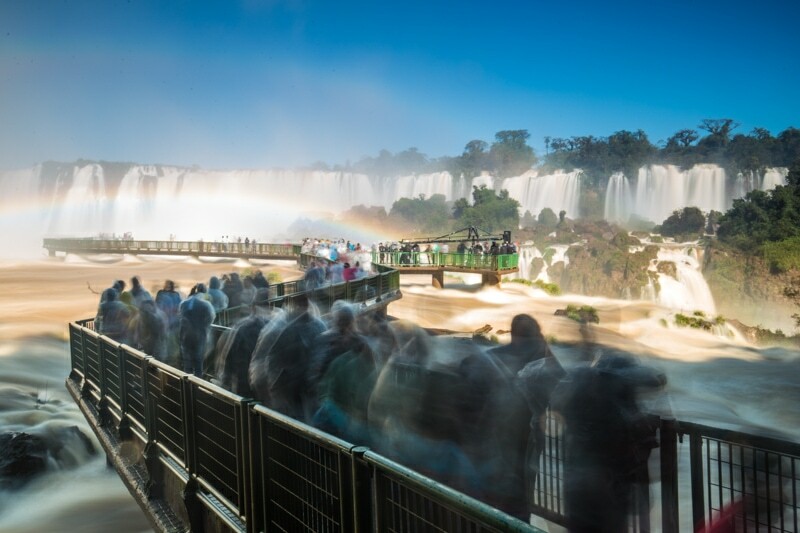 Not only can you find a couple semi-panoramic views of Iguazu Falls, but you can also find some of the small adjoining falls, go above the falls, and get right inside the falls. There are a lot of different areas on this side of the park that allow you to spend an entire day and still not feel like you’ve seen it all. Nature Trails: One of the best parts of the Argentinean side is the variety of nature trails available. It allows visitors to spread out a lot more and makes the park feel less crowded than the Brazilian side. 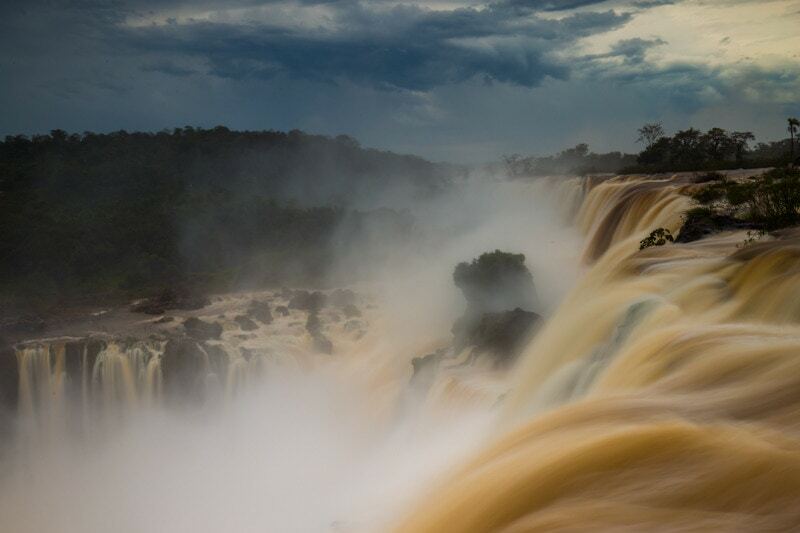 Get Right on Top of the Falls: On the Argentinean side of Iguazu Falls, you can get right on top of the waterfall. In places like the Devil’s Throat, you are literally hanging over the edge of the most powerful section of the falls. It’s really a humbling experience. It’s hard to really talk too much in negative terms with the falls. They are spectacular. But, there are downsides to each side of the falls. Impossible to capture it all: It’s downright impossible to see just how vast Iguazu Falls is from the Argentinean side. Sure, there are places you can see a lot of it, but you certainly can’t see much more than a fraction of it at a time. The Train: I understand the need for the train. Some people can’t handle the distances between certain parts of the falls, but the line ups for the train are insanely long. To make matters worse, sometimes they don’t let you walk certain sections like to Devil’s Throat so you’re forced to wait. The first time I visited Iguazu Falls, the Brazilian side was my favourite by far. In fact, I was quite bullish in my preference. I think, part of it was because the Argentinean side was so crowded and I was fighting expectations a bit. The other part of it was that the Brazilian side made me realize just how big it really is. I was floored when I saw it from the Brazilian side for the first time. 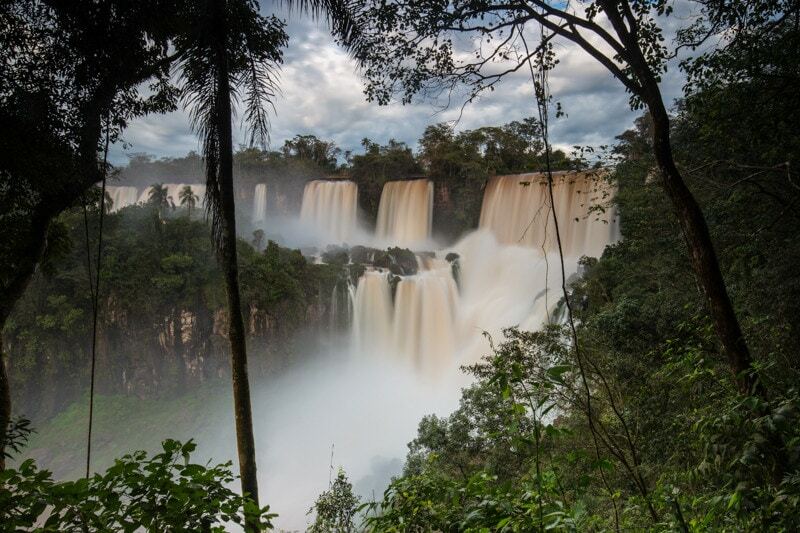 Panoramic Views: If you want that classic panoramic view of the waterfalls, you get it on the Brazilian side and not the Argentinean side. Because 70-80% of the falls are on the Argentinean side, you really can’t see the scale of them from the Argentinean side. On the Brazilian side, you see everything. Better Viewpoints: On the Brazilian side, the viewpoints are slightly better placed, and there are more of them. They allow people to get out of the obstruction of the trees and see the falls a bit better. 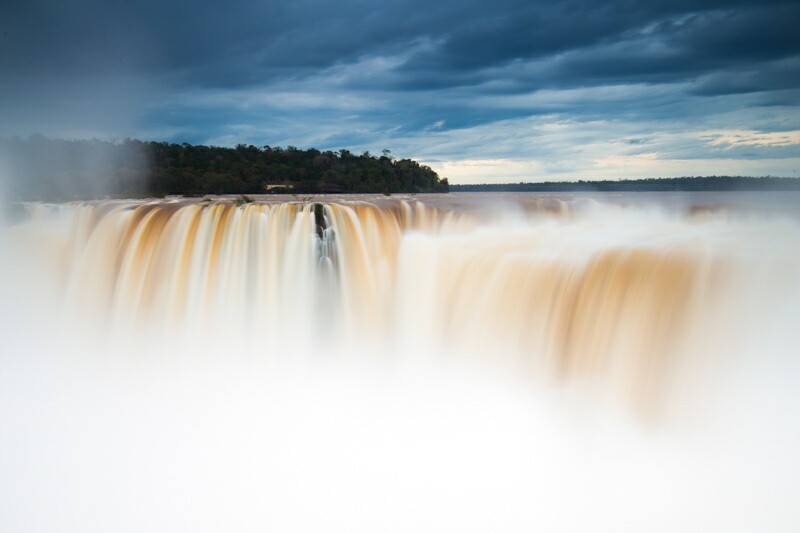 Feel the Falls: Tourists always seem to say that you see the falls from the Brazilian side and feel them from the Argentinean side. But, I don’t really buy that. In fact, I feel like you get a better feel for the power of the falls from the Brazilian side. I mean, the boardwalk that leads into the Devil’s Throat gives one a greater sense of the power of Iguazu Falls than anywhere else, I think. Other Things to Do: On the Brazilian side, you also have the opportunity for a couple falls and non-falls related activities. You can take the boat trip into the falls themselves, and it’s a bit cheaper than the other side. You can also do the helicopter ride from this side for about $100. There’s also a really cool bird park just outside the gates of the Brazilian National Park entrance. There are Negatives to the Brazilian side, but they are also fairly small and easy to get around. Can feel crowded: Because there is only one trail along the canyon on the Brazilian side of Iguazu Falls, it can feel a bit crowded. Especially if you’re there on a weekend, or a holiday like I was. Brazilians are “selfie” crazy and spend a lot of time trying to take photos of themselves in front of the falls. It can ruin the experience a bit. And, unlike the Argentinean side, I think it’s a bit more difficult to find places to get around the crowds here. Only a Few Views: There’s really only a couple different views of the falls here. On the Argentinean side, the variety of the experience is far greater. This is, obviously, debatable. I think last time I much preferred the Brazilian side for photography. However, this time I got far better photos from Argentina and found that there was a far greater variety to the images I could get. On the Brazilian side, I felt like I was taking the same photo over and over again and had to try to get really creative to get cool photos. Of course, I had terrible light on the day I was in Brazil and phenomenal light when I was in Argentina, so that makes a difference. Again, the moral of the story is that one side of the falls isn’t necessarily better, they are just different, and you will get different photos from one side of the falls to the other. Love the double tier to the fall here. I had really high waters at the falls! The boardwalk into the Devil’s Throat. Close up to the falls. To Stay in Puerto Iguazu or Foz do Iguassu? I get asked this question a lot. 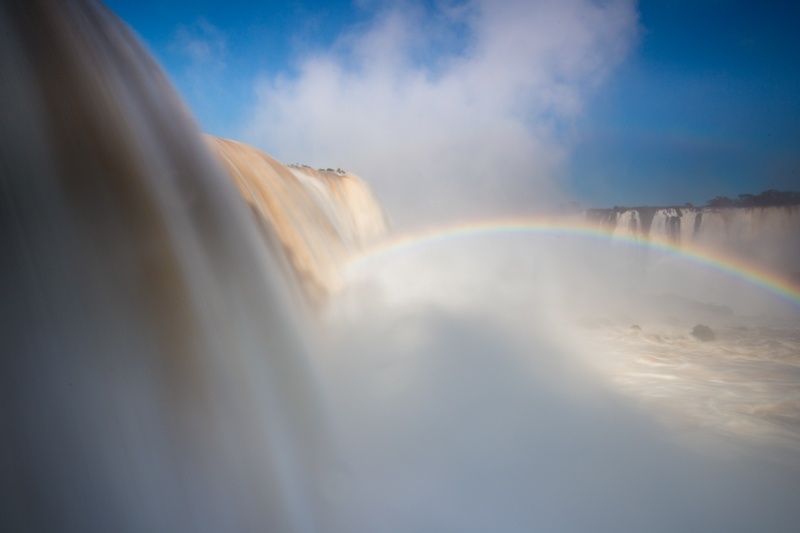 “If I’m visiting Iguazu Falls, and want to see both sides, which country should I stay in?”. Although it can depend on your travel situation, I think that you should stay on the Argentinean side. The reason is that it can take an hour or more to get across the border from one side to the other. And since you’ll need the whole day at the Argentina side and likely only 2-4 hours on the Brazil side, it makes more sense to “waste” your time travelling on the day you visit the Brazilian side. That being said, I actually stayed on both sides of the falls, as for my plans it was much easier. So, you might think that the conclusion is that one side is not better than the other. And, the truth is, you’re right. One side of the falls is not better than the other. They are different. Not equally, but neither is better than the other. 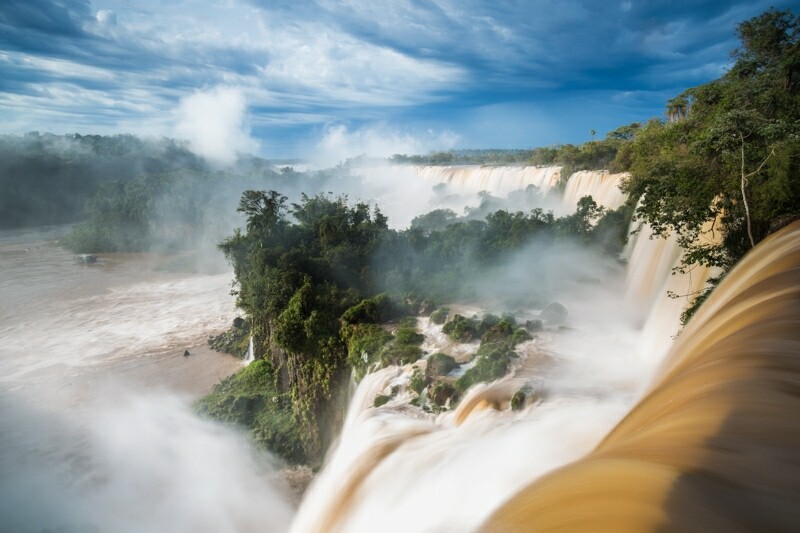 That being said, I’m a big fan of hypotheticals and if you were to ask me the question of “you can only visit one side of Iguazu Falls in your life, which do you visit?” I’d probably choose the Brazilian. The reason is simple, for me. On the Brazilian side you can see it all. You can truly admire the sheer power, and scale of it. And, you could also go up on the chopper ride and down on the boat trip. But, if you don’t have to make a decision. Just visit both sides. You can really never get too much of Iguazu Falls. I’ve been now a couple times, and I’m already looking forward to the next time I get to go. It is an incredibly special place. I’m really excited to be headed back into Brazil for 6 weeks of adventure. I’ll be mixing it up with a couple new destinations and some that I’ll be revisiting. Look for the next article to come from the coastal town of Paraty and then the island paradise of Ilha Grande! 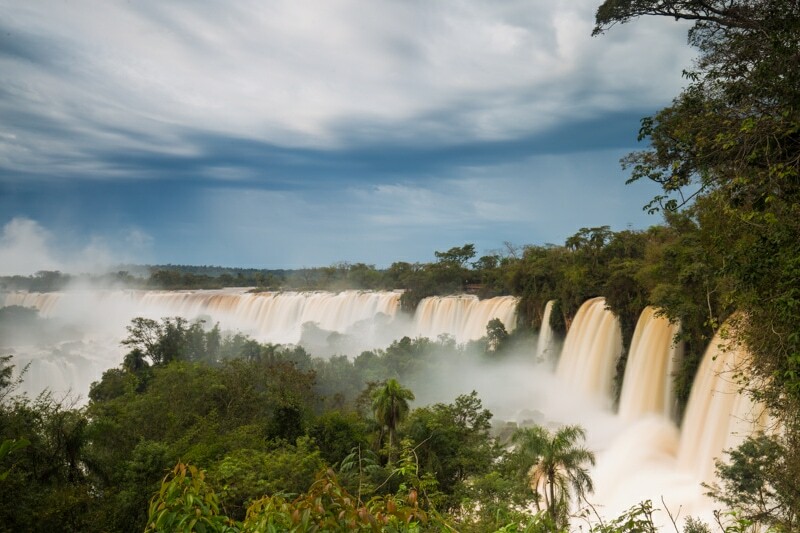 Perfect timing – I’m off to Iguazu in two weekends! Thanks! The images in this post are amazing! 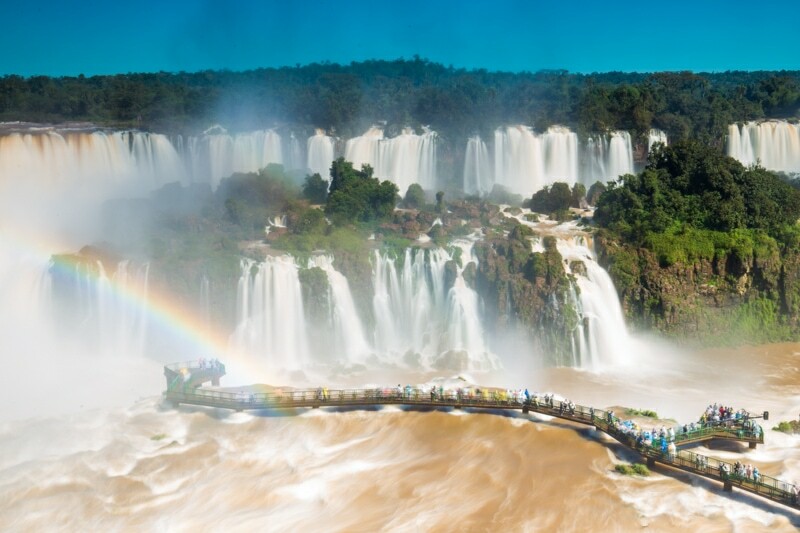 I’m going to Iguazu Falls in November and as of right now I’m only planning on going to the Brazilian side so just in case I don’t make it to the Argentina side I’m glad to hear that I’ll have just as good of an experience on the Brazilian side. Thank you for sharing these pros & cons! Hope you are keeping well. I am contacting with regard to asking if you would be willing to consider a short Skype interview or my YouTube photography /Travel Channel. I am about to go on a 2month long journey across australia, New Zealand and parts of indo – china. I am confident that as an very experience Travel / photographer and journalist what you have to say on the subject of traveling and photography will be both invaluable to both me and my viewer. While I am traveling I will continue to make videos on the road and as such would welcome the chance to interview you whilst I travel. I hope this will be possible And I look forward to hearing back from you on this matter. Hey mate, you can always shoot me an email via my contact form. The truth is, however, that right now I’m SUPER busy. But, like I said, shoot me an email. Some free time might pop up. known to be very beautiful. good as the one in Brazil, hehe. As a photographer, I really appreciated your commentary! Of the many reviews I have read on the internet, yours was by far the most helpful and to the point. I was especially appreciative of you labeling which shots were taken from which country so that the viewer could decided from themselves as people have differing opinions of what they like to capture in their images. Thanks so much for putting this together! Very helpful!